Around 1824, one George Goodall enclosed about ¾ of an acre on the Heath, and a little later built himself a cottage there, which became no.20 Church Road, but he was astute enough to build his house on just one side of the frontage of the property. He was one of the ‘squatters’ of Aspley Heath, as he had no right to the land. After he had occupied it long enough, (and got others to swear oaths that he had held it, for perhaps years longer than he actually had! ), it legally became his. Fortunately, a number of the deeds for this property are deposited at the Bedfordshire and Luton Archives and Records Service under the Greene King archive collection. George had been ‘on the parish’ in his time, meaning he was supported with parish money as he didn’t earn enough to support his family. In 1827 he was given a week’s pay to assist him building his house, and later in the year, he was being paid 2/6 and 3/6 a week. On another occasion he was given a bit-saw, to help him in his work and keep him from drawing more funds from the parish. After his death, his son John inherited the property and lived there with his widowed mother. After his marriage, in 1850 he built himself another cottage (no.18 Church Road) adjoining his late father’s. The cottage was a simple design of two living rooms, each about 12ft. by 11ft. with two corresponding bedrooms over, and resting on the back was a timber-built barn, 17ft. by 13ft., while 40 yards away up the garden was a boarded stable and the family closet. Other rooms have since been added on the lower side. The large barn and range of stabling has long since been pulled down. The water supply was from a well in the lower front corner of the garden. To create a proper title to his property, and obtain £180 mortgage from the Woburn Benefit Building Society, in June 1853 John Goodall swore an affidavit that his father had built the property in about 1826, and had lived there till he died about 1839. His mother then lived in the house, until she died in in 1851. Before she died, John had built his cottage next door, on the same land. He mentions there was a dispute about the ownership his father’s cottage after his father death, but that he has never paid rent to anyone for it. This was probably the Duke of Bedford trying to reclaim the land that was originally his. On the same day as his affidavit, Thomas Keens, bricklayer of Woburn Sands, also swore that he remembered George Goodall throwing up a bank around some land in 1824, and building a cottage two years later. Keens’ father had also erected a house nearby, by fencing off the Dukes land and building a cottage. He recalled that some years ago, there had been some dispute about the local cottages, and one had been pulled down, but his and Goodall’s were left alone. Three years later, Goodall bought land behind his cottage from Gabriel Ireland for £12. Gabriel had had to state he had had undisturbed occupation of the premises for 30-plus years. Goodall gave the cottage his father had built to his sister, who was married to John Sollom. Sollom, like the Goodalls, was a sawyer by trade. Goodall owned most of the land now occupied by St Michaels churchyard, and had four acres fronting the top of Church Road, which was later the hockey ground of the Knoll School. He also had land in Aspley Guise, and became a timber merchant with a yard near Woburn Sands Station. The money the parish had spent on a simple saw for his father George was money well spent! Goodall took a further mortgage from George Woods of Oakley, a keeper for The Duke of Bedford, for £120 in 1860. I would be surprised the Duke was involved directly in lending money to the people who had fenced off his land and effectively stolen it, unless perhaps he thought the squatters would default on their loans and he would be able to reclaim the land. Goodall took another mortgage for £400 on New Year’s Day 1862, from Elizabeth Platt of Bedford. This much larger amount was secured on all Goodall’s property and land on Aspley Heath. It looks like he was able to pay this off by 1866, but a year later he re-mortgages again, to John Thomas Green, a Woburn solicitor, for £1000. Crucially, this included the right for Green to sell on the properties. £1000 is a large amount of money for 1867, but Goodall went back for further loans for more than £2500. Was this to start his timber yard at Woburn Sands Station? John Goodall remained in his cottage until about 1868-69, when he sold it, along with the other pieces of land he had acquired, to John Green, the Woburn lawyer. It was apparently Green who obtained the first beer licence. John Goodall never appears as a licensee, and the deeds show it was only licenced after he sold it. (He did, however, later become owner of The Station Hotel). Arthur Parker, the late village historian, believed Goodall may have been running an unofficial beer trade from the cottage as a side line. The trade probably arose from the demands of the sandpit, woodsmen and Fullers earth workers, returning down the hill from work, tired and thirsty. It shows how long news took to travel, as the change of license was not reported in the Northants Mercury until 4th February 1871. That year, the census also took place. Although there is no specific entry in Aspley Heath mentioning the Royal Oak, William Hill is there, listed as a Pianoforte Tuner, with his wife, two sons and a daughter, and a visiting dressmaker also staying at the house. Newland wasn’t above borrowing on the inn either. In 1877 he secured £1200 on the Royal Oak and The Dukes Head, Aspley Guise, from Edward Rose, a Bedford draper, and then over £13,000 from Charles Powell of Newport Pagnell, against a large number of the breweries properties, notwithstanding the mortgage already on the Royal Oak and Dukes Head. At the next census in 1881, Ingle was still there, with his wife Rebeckha. He was 70 and she 71. There were also six lodgers and travellers in the house. It must have been a tight squeeze! 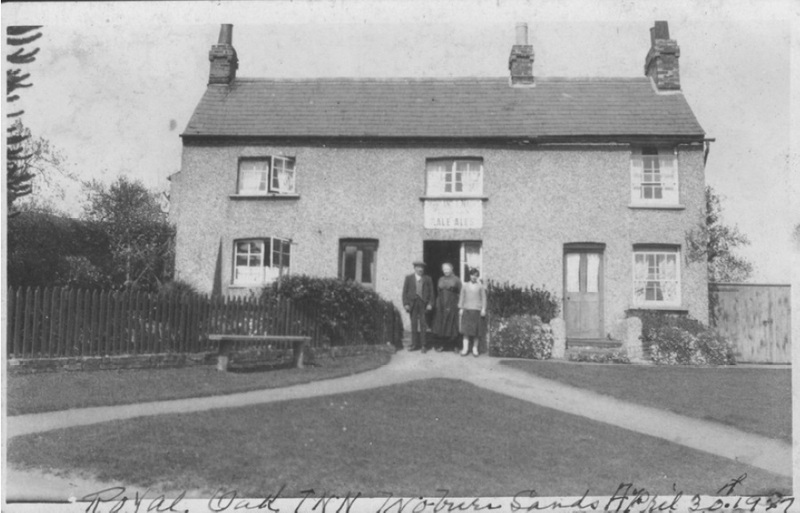 The Royal Oak in c.1937. By kind permission of Mr T. Nightingale, Florida, U.S.A.
An edition of the Northants Mercury in November 1889 reported that the licence was transferred to a John Clarke, but it does not record who from. At the 1891 census, Frederick Brawn was landlord, with no lodgers in the house, but I doubt they had room, as they had seven children themselves. Frederick helped make ends meet by also working as a gardener. He was originally from Northamptonshire, and most of his children were born in Yardley Gobion, Cosgove and Grendon. In 1901, the landlord was Joseph Wilson (61), with his wife Sarah (63). They were from Wellington in Salop, and had one daughter, Alice (22) with them. The 1903 Licensing Return stated that the house was clean and in fairly good repair, but it still only had a beer licence. The Wilsons stayed from 1897 to 1910. A year before the 1911 Census, the Wilson left to be replaced by John Cowell. He and his wife Mary had five children, one of whom left Woburn Sands for a new life in Canada in March 1911. They still managed to squeeze one lodger in, Thomas Clarke. Cowell was also a stationary engine driver, possibly getting work both agricultural and at the local fullers earth works, although the main local mining firm had folded in 1900. Cowell was still landlord in 1927, when the inn was valued under the terms of the Rating Valuation Act of 1925. Every piece of land and property was inspected to determine the rates to be paid on it. At that time the Royal Oak consisted of a tap room, kitchen, private living room and scullery downstairs, with a cellar beneath. The inn must have been extended by this time, as by now upstairs there were five bedrooms and outside a washhouse and WC and coal barn. Trade consisted of about three barrels of beer and three dozen bottles of minerals per week. Rent was £12 per annum. The valuer noted: “a lovely little green patch in front”, and that the tenant “Keeps house very clean & I think some personallity here”. He stayed 16 years until 1949, when Alexander Carlile took over. His licence application was still only to sell “beer, wine, cider & perry”, with no spirits, but he soon moved on to run The Swan, in Woburn Sands in 1953, and William Harris took the pub. The rest is modern times really. * Information from Bedfordshire Archives & Records Service.